Every once in a while we come across an idea so fresh and simple it seems incredible that it has not been thought of before. 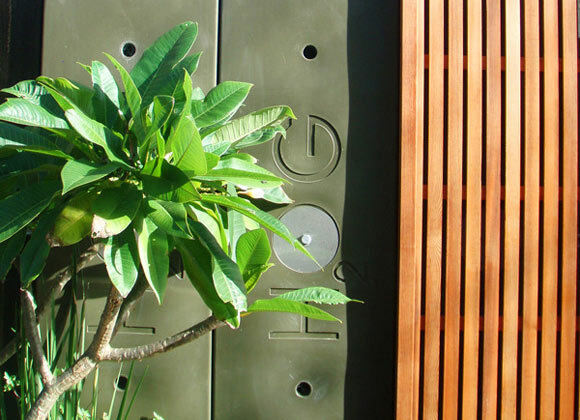 The Rainwaterhog is just such an idea – the H2OG system is a modular rainwater harvesting system that is a ‘game-changer’ in the water harvesting and storage industry. The easy-to-install system “boldly fits where no water storage has fit before” and is expandable, reusable, and 100% recyclable. Rainwater harvesting is hardly new. Time-honored methods have been in existence for decades – they usually feature an elaborate system of screens, gutters and drains that are designed to divert rainwater to a large central basin or cistern—above or below ground—after which a pump or series of pumps relocates the precious water to locations around the property. This traditional system can be complex, costly and far from easy to create. Enter the Rainwaterhog, a modular, DIY, expandable, reusable, and remarkably elegant design by architect and designer Sally Dominguez. Simply put, the Rainwaterhog is a system of 100% recyclable, 1/4″ thick, UV stabilized, food-grade plastic 50 gallon units that can be connected with standard 1″ brass fittings to create a custom, DIY system. The modular nature of the system allows homeowners to place the HOG tanks at several different locations throughout the property, thereby lowering pumping and electricity costs and avoiding unsightly and/or costly large central collection units. H2OG systems can be located under decks (they’re sized perfectly to nest in-between the joists), in side-yards and other underutilized locations that can now serve as a significant source of water storage for your garden and home. According to the H2OG website a system can be worth up to 9 LEED points. All this, and the modules look great too! Hi Lux Thanks for taking the time to comment on my HOG design. We make HOG with 15 %recycled content for non-potable use, but not 100% recycled bacause that would not have the longevity - you cant predict the "creep" in the recycled material over time. You can in fact drink from the food grade HOG as long as the inlet filtration is specified for that purpose - we just have to say "not for drinking" because that is what the utlities tell us we have to say!!! I would happily drink from a HOG. I like this, I've been thinking about water harvesting but didn't really have room for a large cylindrical tank, but I can see putting these under my decks and against the side of the house...But I notice they are made of food-grade, virgin plastic. They caution the user not to use them for drinking water because roof water is already contaminated...so wouldn't these be candidates for recycled material. Why not make them out of recycled plastic? I'm asking because I'm interested. Every once in a while we come across an idea so fresh and simple it seems incredible that it has not been thought of before. The Rainwaterhog is just such an idea - the H2OG system is a modular rainwater harvesting system that is a 'game-changer' in the water harvesting and storage industry. The easy-to-install system "boldly fits where no water storage has fit before" and is expandable, reusable, and 100% recyclable.